Each school has its own Local Governing Body. This body of governors report to The Dean Trust Board. Within each Local Governing Body there are several small committees which focus on particular areas such as: HR & Personnel; Pupil Progress; Curriculum and Standards. Additional committees are formed from across the Trust Board and LGBs as and when required to deal with specific areas such as Admissions or Health and Safety (Environment/Premises). Some individual governors have responsibility across more than one school in the Trust due to their skills and experience. If you would like a copy of any of the meeting minutes please contact the Governance Support Officer in the first instance. Parent Governors are elected from within the parent body of the school when there is a vacancy. Any vacancies will be advertised on the school website. Staff Governors are elected from within the staff body of the school when there is a vacancy. 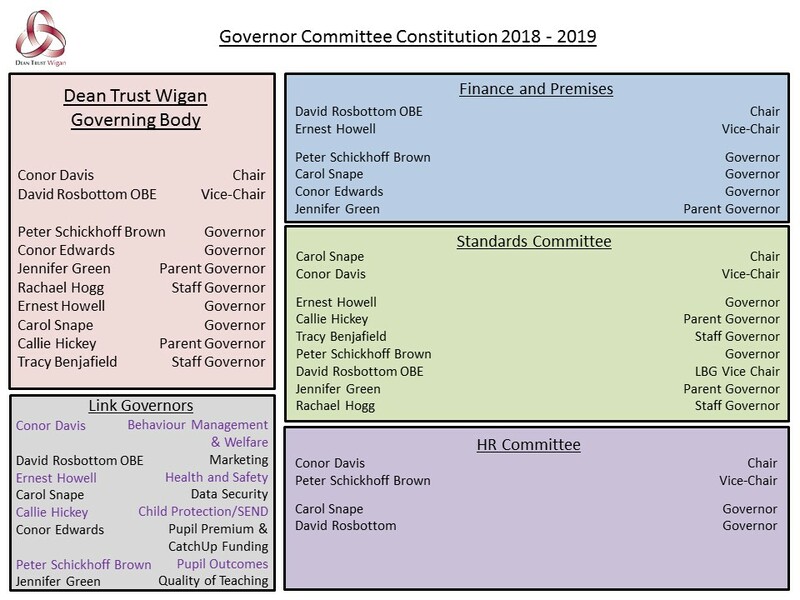 Dean Trust Wigan Governing Body is made up of the governors listed below, by downloading our committee constitution, you can see which committees the Governors are in, and their link roles within the school.